Despite a massive reduction in the percentage of Americans who smoke in the last few decades, 36.5 million people in the U.S. still smoke, and nearly half of them suffer from a smoking related disease or illness, but Kick Butts Day wants to change that. Kick Butts Day is a national day of activism that was created to empower people of all ages (but especially young people) to raise awareness about the problem of tobacco abuse in their communities, to inform fellow young people about the oft-deceptive nature of tobacco advertising, and to urge political, business, and cultural leaders to help protect Americans from smoking and smoking-related diseases. Who Started Kick Butts Day? When was it started? 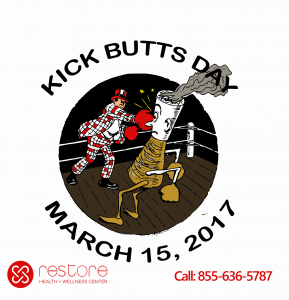 Kick Butts Day was founded and is currently organized by the Campaign for Tobacco-Free Kids, a 501(c)(3) non-profit organization that works toward empowering, educating, and helping young people understand and avoid the harmful side effects of tobacco use. The first Kick Butts Day was held in 1996, so this year’s Kick Butts Day will be the 22nd in the day’s history. What Does Kick Butts Day Want to Change? While youth smoking has consistently decreased for the last few decades, millions of young people in America are still smoking– and the Campaign for Tobacco-Free Kids attributes much of that to tobacco industry marketing efforts. According to the Campaign’s website, Kick Butts day is specifically intended as a way for kids to understand, analyze, and criticize the way tobacco is being marketed to them. When young people begin to realize exactly how they’re being persuaded, they can begin to stand up against deceptive and misleading advertising and make healthy, independent, and well-informed life choices. What are Young People Doing for Kick Butts Day? In schools, libraries, and youth centers across the country, young people everywhere are participating in a variety of activities to increase their awareness about the harms of smoking and the benefits of quitting. In particular, students will study the medical and economic effects of smoking on American society, including the facts that nearly 500,000 Americans die each year from illness directly caused by smoking and that smoking costs more than $300 billion each year in terms of health care costs and lost economic productivity. Suffering from the disease of addiction can be an incredibly difficult challenge. Unlike other diseases, which are primarily either mental or physical, addiction is combination of both, and results from a variety of genetic, environmental, mental, and emotional factors. Since addiction happens for a variety of reasons, it needs to be combated with multiple tools, and you’ll find those tools at Restore Health and Wellness Center. At Restore Health and Wellness, our combination of traditional, alternative, and holistic therapies takes into account the needs, challenges, and mental, physical, and emotional condition of each individual patient. Addiction is different for every individual, and different patients often need different tools in order to fight it effectively. Our customized and comprehensive addiction treatment programs can help you achieve and maintain lasting recovery.